After President Obama’s pullout from Iraq, the fastest money making trend now in Iraq, besides the total tag of one billion worth of 2,300 Humvees that were snatched by ISIS in Mosul alone, is not gold, silver or oil, but real estate plots in the Valley of Peace. The plots, thanks to Obama’s pre-mature pull out of Iraq, have risen dramatically from $500 to $3000. Had you been invested in a plot in Najaf’s Valley of Peace in 2007, your investment would have increased 600%. But the gravy train is still awaiting more investors since $3000 is nothing considering the rising demand. Here, see in the photo below what you would be investing in. What seems to look like homes studding as far as your eye can see, are not really homes, but an entire city in Iraq called The City of the Dead. Lately it had to dramatically be expanded to fit the daily casualties in Iraq making this grave site the largest and most occupied graveyard in the world and the best investment opportunity in Iraq after the U.S. pulled out. So in Iraq, what Obama’s policies did, and besides the armored vehicles that were snatched, there are lives that are continually being snuffed out and it happens on daily basis, a phenomenon which is a hush-hush by Iraqi Government, as it is by the Obama Administration, where no one wants to reveal that all what Obama contributed for Iraq is to jack up the prices of grave plots. The secrets and daily killings is rarely shared in western media circles. Today, throughout all Iraqi cities walls can be seen covered with black banners from Sunni terrorist attacks against civilians which increase in ferocity, while Shiite Iraqi militias, whom Obama supports to combat ISIS, commit similar atrocities against Sunnis that are just as ugly as Isis’s. Burial plots, Humvees and ISIS, had these been stock picks, they would been the best investment opportunities in Iraq today. After all, ISIS so far seized nearly half of Iraq (40%), imposing a gloomy, fear-filled atmosphere throughout the region and even including the graves, there is no end in sight. Besides Isis cake-walk land grabs, Iraq has become the biggest indirect American weapons supplier of ISIS, said Masrour Barzani, citing the heavy weapons, vehicles and ammunition the extremist group seized from the Iraqi Army in Mosul and Ramadi. Iraqi citizen Saadoun al-Fatlawi, a retiree who worked in the Ministry of Commerce, paid $500 for a cemetery plot in 2007 that can accommodate about six bodies. To his surprise, however, when he wanted to buy an adjacent plot for his brother who was just killed, the price had exponentially increased dramatically to about $3,000 per gravesite. In the city of Najaf in southern Iraq the constant flow of coffins where graves workers say they average 60 coffins per day which arrive for Iraqi shiites killed by ISIS. The Iraqi government keeps a tight lid on the number of deaths in the fighting with ISIS, but the cemetery City of the Dead is also called Valley of Peace in Najaf and is now the largest cemetery in the world where Iraqi Shiites receives scores of bodies daily. The graves in the Valley of Peace (City of the Dead) stretch for up to 10km along the valley and is the only cemetery in the world where the process of burial is still continuing today since more than 1,400 years making it one of the strongest contender for the title of the largest graveyard on earth. In that massive graveyard, there are the dead from the eight-year war with Iran, and those who perished in during the American occupation of Iraq, and then there are the victims of the bloody conflicts and sectarian violence that followed the invasion. The daily influx of bodies comes mostly from the Shiite militia Badr Forces, The League of the Righteous, and the Peace Brigades of Moqtada al-Sadr whose record for the deaths is numbered separately. The workers say the cemetery washing rooms, where most of the bodies go to be prepared for burial said that the death toll is much higher. One cemetery official, named Fadel al-Zubaidi was asked on the current bodies he is preparing in one day, he replied: “between the four main washing centers, there are about 40 to 60 people come from Tikrit alone,” adding that most of them Shiites or members of the Shiite militias who come to fight despite superficial knowledge of military matters of war coming in as volunteers seeking martyrdom. Al-Zubaidi heard a lot of details about the battles from fighters returning from the battlefield, talk about ambushes and pro-government fighters who are burnt and cooked alive in captivity. He said he suspected that the authorities, in some cases, reserves the corpses and do not publicize the death tolls. He added: “at times there will be hundreds of soldiers killed in one day, but the morgue does not hand over the bodies all at once since it is a very sensitive matter”. Vengeance goes both ways. Shia and Yazidi militia have been carrying out attacks against Sunni communities in revenge for Isis crimes in Iraq of deadly attacks on Sunni Arab communities by Shia. One can even find Shiites beheading Sunnis and even cooking their bodies as if they were rotisserie sheep. Cooking human beings is carried out not by ISIS but by Iraqi forces. Notice the middle photo of a young man being cooked. Even Wadi Al-Salaam graveyard has not been immune from sharing in the Iraq war since 2003, where heavily-armed fighters of the Iraqi militia frequently used the cemetery to hide and ambush approaching enemy units. The Americans at the time could not get into the area, because it’s full of winding lanes and underground mausoleums. The local gunmen who knew their way around would hit and then run and hide inside the many tombs. When the rebels took refuge in the narrow spaces among the crowded tombs the Iraqi army ruthlessly bulldozed its way through the graves of its fellow soldiers. To this day, piles of wrecked cages from the graves remain stacked on the roadsides. The violence that has overwhelmed Iraq since 2003 has lead to a massive expansion of the graveyard, swelling it by 40 percent to about three square miles. The cemetery has grown every year since 2004, first with the clashes against American forces, then the sectarian wars of 2006-2007 when Shiites and Sunnis were killing each other at a murderous rate, and finally in the 2008 battles with the Iraqi army. The weirdities coming from the Muslim world never ceases to surprise, from $500 to $3000 for a burial plot, is an increase that is difficult to pay just in order to be buried close to the Shia’s icon, Ali bin Abi Taleb, Muhammad’s son-in-law where such a desire generated an entire City of the Dead with a population of nearly six million corpses. The phenomenon of land purchase in the cemetery, that even in their graves, Iraqis are interested in their social status since those who are not buried in Al-Salam Valley cemetery or in a place related to it, are criticized by the community, or perceived with disdain. Al-Salam burial sites are considered prestigious by Iraqis, especially Shiites. The religious custom calling for the burial of the dead in this cemetery made it overcrowded and prompted many people to purchase plots in Al-Salam Valley prior to their death to guarantee a spot in this holy land. Shiites believe that when resurrection time comes, Imam Ali ibn Abi Talib will intercede with God on the dead’s behalf for whatever sins they committed during their life on earth. If one thinks this is weird, try being a dead Sunni. 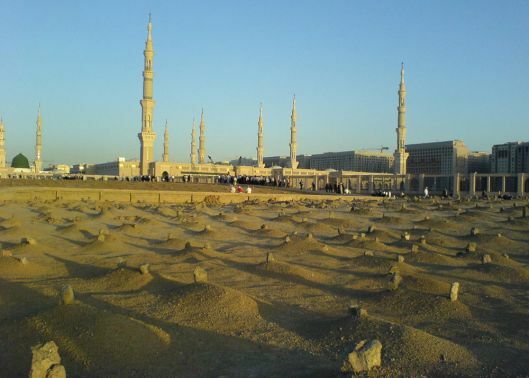 Getting buried in the Al-Baqi graveyard, in Medina, Saudi Arabia, where Muhammad, the prophet of Islam was buried, it is one million dollars, not for a plot, but believe it or not, for each square meter within the plot. Being buried in that holy land, assures one to enter paradise. A couple million for a humble hole and you don’t even get an edifice, since this is why Sunnis kill Shiites since it is a grave sin to have any edifice or a decorated grave. In Islam, neither Muhammad, Ali, money or even Jesus can buy you love, but a plot for a grave, can assure one’s salvation to a sexually gratifying paradise. In the end, Obama is not to be solely blamed, since in Islam, neither Sunni or Shiite will ever get along, since Islam itself is a religion that honors death over life. Islam is a continual cycle where the dead will always be burying the dead.